--Booklist starred review "In a dazzling interplanetary fantasy from the Siegel Brothers, artists Bouma, Rockefeller, and Sun bring to life the cultures, customs, and creatures of a lively new world that will easily appeal to fans of Naruto or Avatar: The Last Airbender." 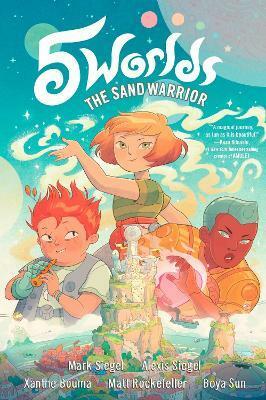 --Publishers Weekly starred review "This sweeping graphic-novel saga features inventive world-building, with history, mythology, and traditions naturally integrated into the narrative. The installment ends triumphantly and tantalizingly; readers will eagerly await book two." MARK SIEGEL has written and illustrated several award-winning picture books and graphic novels, including the New York Times bestseller Sailor Twain, or the Mermaid in the Hudson. He is also the founder and editorial director of First Second Books. He lives with his family in New York. Follow Mark on Tumblr at @marksiegel and the 5 Worlds team on Twitter at @5WorldsTeam. ALEXIS SIEGEL is a writer and translator based in London, England. He has translated a number of bestselling graphic novels, including Joann Sfar's The Rabbi's Cat, Pénélope Bagleu's Exquisite Corpse, and Gene Luen Yang's American Born Chinese (into French). XANTHE BOUMA is an illustrator based in Southern California. When not working on picture books, fashion illustration, and comics, Xanthe enjoys soaking up the beachside sun. Follow Xanthe on Tumblr at @yumbles and on Twitter at @xoxobouma. MATT ROCKEFELLER is an illustrator and comic book artist from Tucson, Arizona. His work has appeared in a variety of formats, including book covers, picture books, and animation. Matt lives in New York City. Follow him on Tumblr at @mrockefeller and on Twitter at @mcrockefeller. BOYA SUN is an illustrator and co-author of the graphic novel Chasma Knights. Originally from China, Boya has traveled from Canada to the United States and now resides in the charming city of Baltimore. Follow Boya on Tumblr at @boyasun and on Twitter at @boyaboyasun.